This quickstart assumes you know how to install Ubuntu and access it through a terminal (command line). EDIT: There seems to be a bug with the latest stable version of Grafana (2.6) and running on a headless system such as the one I’m describing here (Ubuntu Server). This bug causes icons not to be displayed in the web interface. I would suggest either using Ubuntu Desktop (I have not tested this myself) or using Grafana 3 which does not have this bug (I tested this and it does work on Ubuntu Server 16.04. 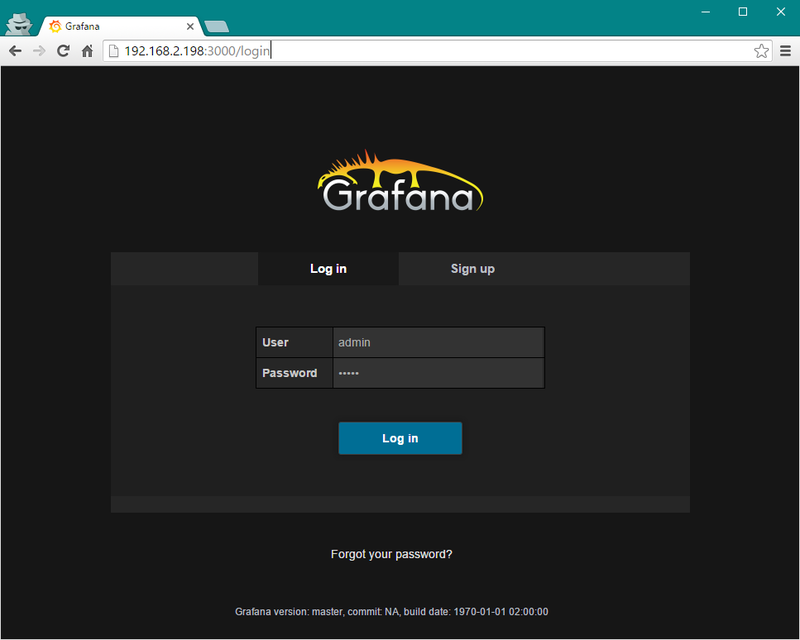 I’ve updated the Grafana installation instructions to include version 3 as well). 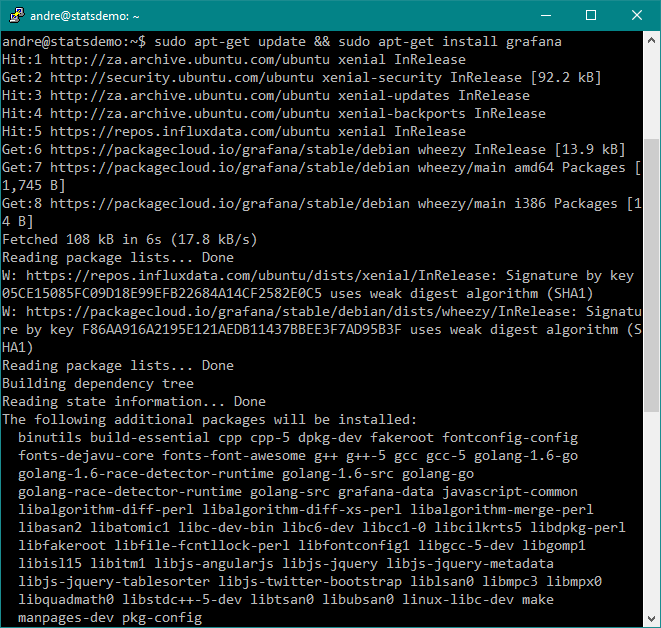 I started with a new installation of Ubuntu Server 16.04 LTS 64bit. During installation, when prompted for which predefined collections of software to install, only “standard system utilities” and “OpenSSH server” were selected. First, configure the package sources. Make sure you’ve previously used sudo in the current session, so that the sudo in the command below does not prompt you for a password again. To make sure, you can just run “sudo ls” and check that it doesn’t prompt for a password. If you copy and paste this, make sure it is three separate lines. This will create a file called “/etc/apt/sources.list.d/influxdb.list” if it worked. 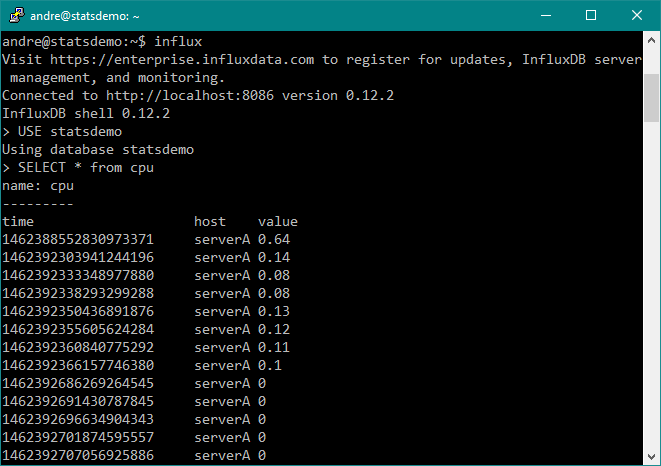 Start InfluxDB. This command produces no output. Create a database. For this quickstart we’ll call the database “statsdemo“. Run this command inside the InfluxDB shell. Insert some test data using the following command. 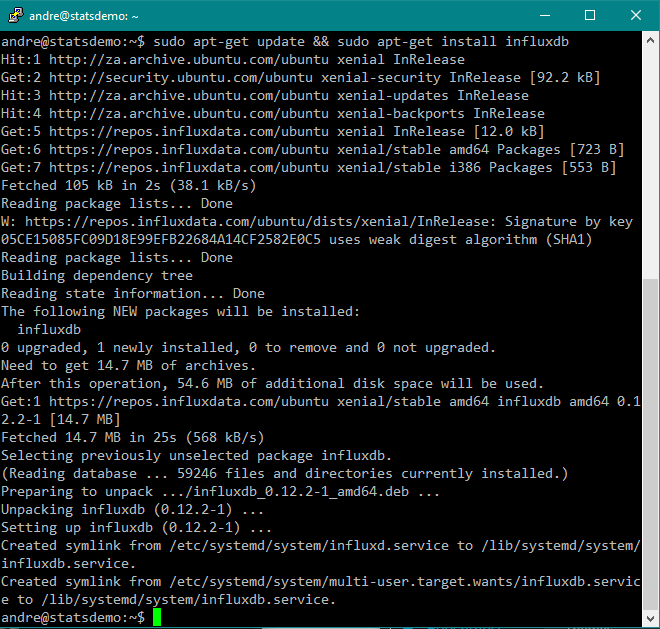 Type “exit” to leave the InfluxDB shell and return to the Linux shell. To have some data to play with we need to write something to the database. Open another terminal and run this one line script. It will continue running until you press CTRL-C and write the current load average of your Ubuntu server every 5 seconds to the database, using the HTTP API of InfluxDB. It will print out something every 5 seconds. Just let it run and collect some data while you do the next steps. 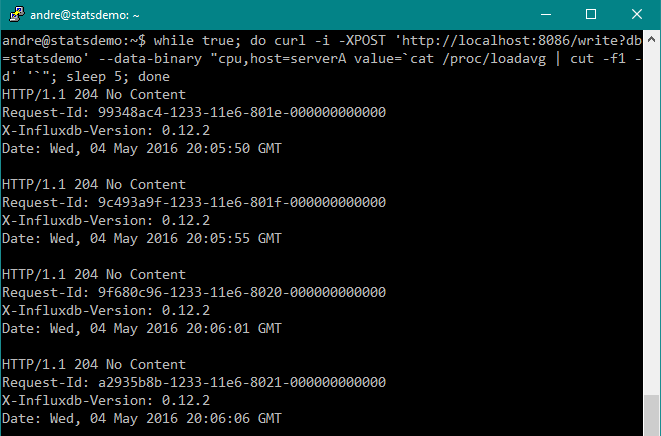 You can verify if data is being sent to InfluxDB by using the influx shell and running a query. Note that if your server is not very busy, you’ll see a lot of zeros being logged for the load average! 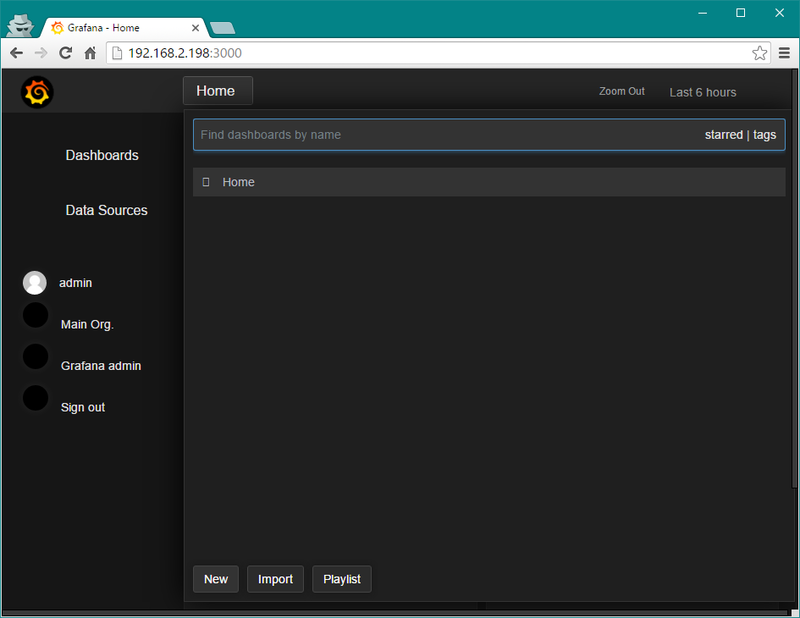 Configure package sources. You can either install the latest stable version (2.6 currently), or the Beta/Testing version (3.0 beta currently). 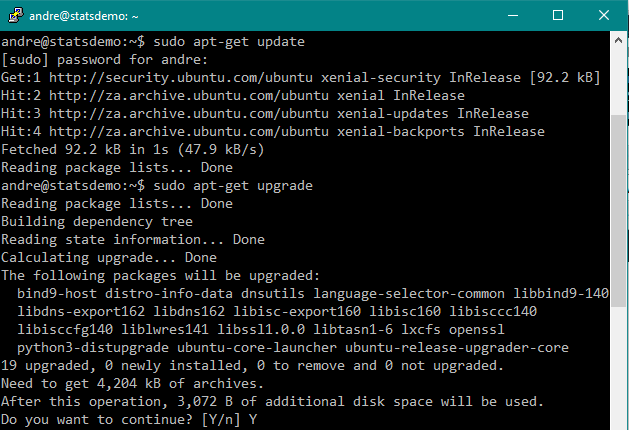 Due to a bug with 2.6 and Ubuntu 16.04 Server, I recommend using the beta version if you’re using Ubuntu Server in a headless configuration (No X). These instructions are for Grafana 2.6, but if you installed the beta version it is very similar. After logging in. click on Data Sources in the left menu, and then on Add New in the top menu to add a new datasource. After adding the datasource you will get a Test Connection button at the bottom, which you can use to verify if your settings are correct. 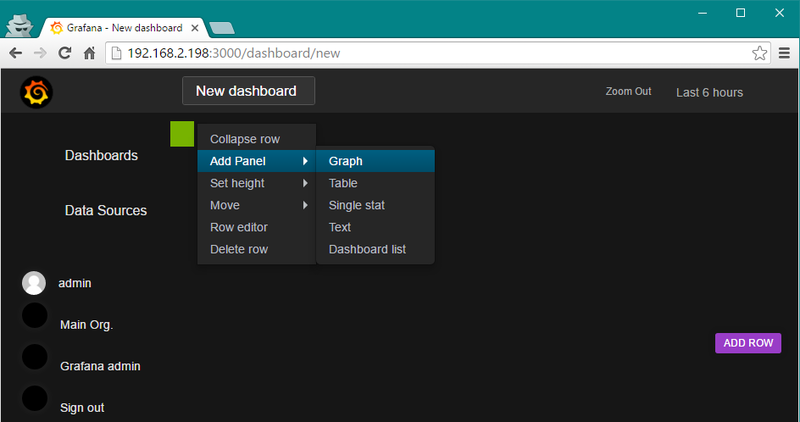 Click on the Dashboards link in the left menu, then the Home menu in the top to get a list of dashboards. Click the New button at the bottom to create a new dashboard. You will get a page with a green rectangle which expands if you hover your mouse cursor over it. If you click it it opens a submenu. Select Add Panel -> Graph from this menu. A sample panel with a graph will appear. With Metrics selected (it should be selected by default), there is a dropdown where you can choose a datasource. Choose statsdemo. A query will be displayed. Click on ‘select measurement’ to choose a measurement from the database. In this case the only one there is the sample data we inserted, called cpu. 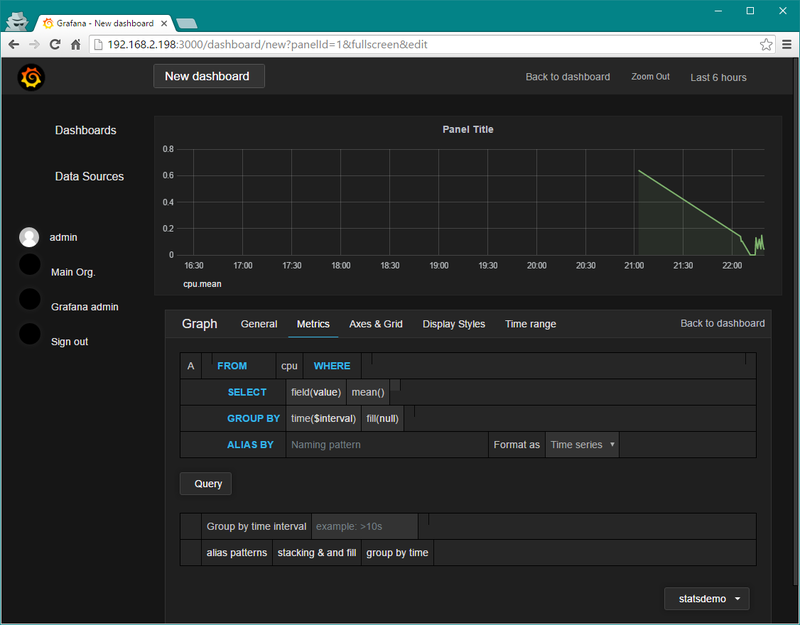 As soon as you select the measurement Grafana will pull the data from InfluxDB and update the graph. 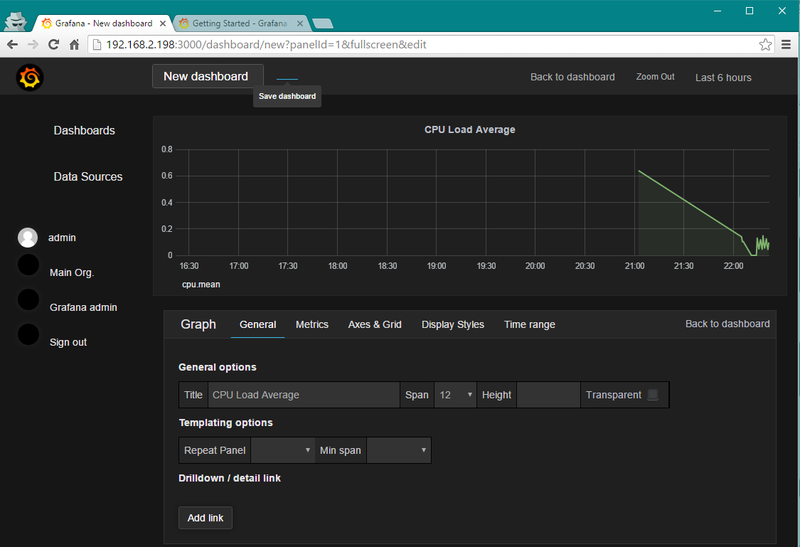 Go to the General tab, and give the panel a better name, for example “CPU Load Average”, and then save the dashboard by clicking on the Save Dashboard icon next to “New dashboard”. (Note there’s a bug in my installation, and the icon does not display, however, if I hover the mouse icon there I get a tooltip saying ‘Save Dashboard). That’s it for now. This dashboard will continue updating as new data is written to InfluxDB. You have a typo in your syntax to copy..
Great post! It was just what I was looking for. I did have some trouble with single/double quote use in the pasted “Writing Test Data” script, though. Terminal whined about an “invalid boolean,” unable to parse. What’s in the console screenshot works, so I used that. Screenshot is right, but text is wrong. Please where is the problem? 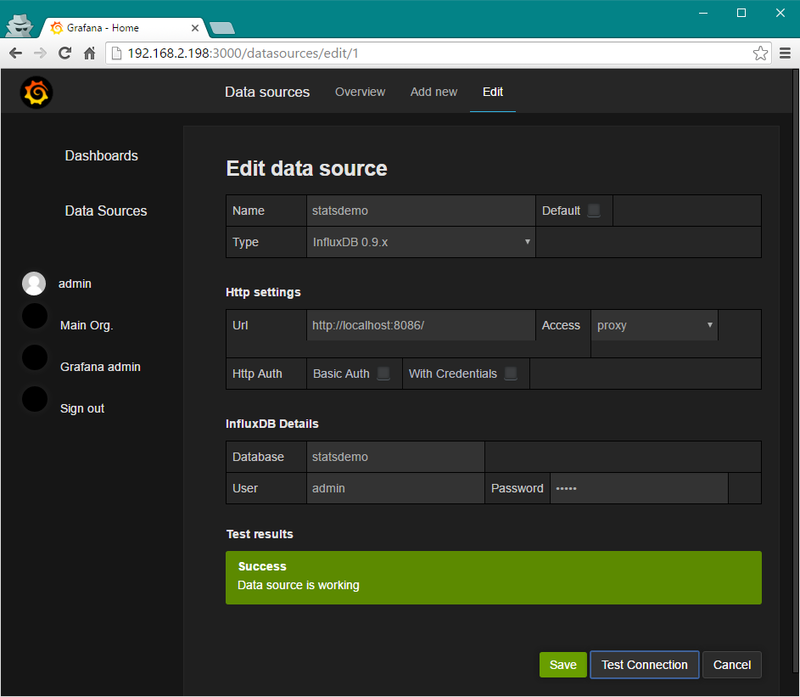 Hi, I created a database based on influxdb then I installed grafana. I chose data source my database. But I can not get a graph in my dashboard. If this doesn’t try manually typing it out from the screenshot above. This is better, no smart quotes. Invalid interval string, expecting a number followed by one of “Mwdhmsy”. …. value=`cat /dev/ttyUSB0 | cut -f1 d” “` – not act. Is it possible for DS18b20+ESP8266 ?